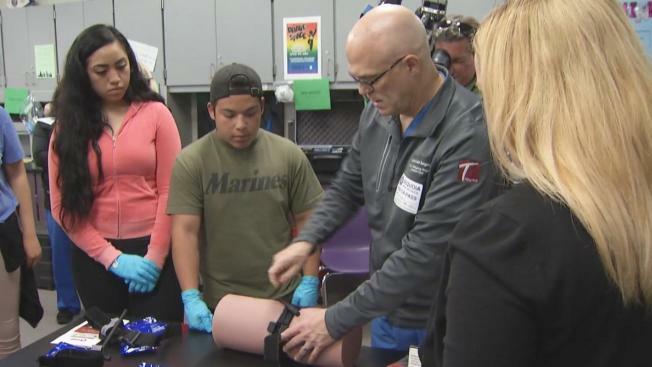 Redwood City students on Thursday got a crash course in what to do following a terror attack from some of the best doctors in the nation. The students at Sequioa High School hope they never have to face a mass casualty situation. But in the event, many students feel they are now ready to help save lives thanks to a visit from a Stanford trauma team. "These students are now sort of an extension of the Stanford trauma team," said Dr. David Spain, Stanford's chief of trauma. The Stanford trauma team said in 20 percent of emergency cases, a person's life could have been saved if bystanders knew how to stop the bleeding. The school said there is now a little sense of relief should the unthinkable happen. "Feels like you're obligated now," student Roger Soriano said. "But in a way that's good and you know you can help save someone from dying."